If you're looking to return to the world of farm sims, you've found the right game—if you can tolerate its sleepy first act. It's been one strange year for the long-running Harvest Moon series. In late 2014, Natsume released Harvest Moon: The Lost Valley in North America and Europe, and without the usual involvement of longtime developer Marvelous. Meanwhile, Marvelous' Harvest Moon efforts continued in Japan, resulting in last year's Bokujō Monogatari: Tsunagaru Shin Tenchi—in case you were wondering, "Bokujō Monogatari" is Harvest Moon's Japanese title. That very game—which launched a little over a year ago in its home country—arrived this week in the form of Story of Seasons, entirely because Marvelous doesn't have rights to the Harvest Moon name overseas. Yes, it's complicated. But the most important thing to take from all of this? 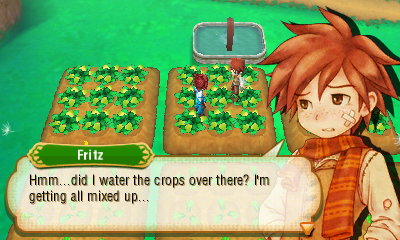 Story of Seasons is about as Harvest Moon as you can get. That's important to remember, because The Lost Valley attempted to break away from the traditional formula for something more inspired by Minecraft. It made for an admirable effort, but this new version of Harvest Moon amounted to a solitary and repetitive experience, even if digging through endless squares of soil could be strangely meditative. (And if you're interested, you can read my thoughts on The Lost Valley right here.) If you've been following Harvest Moon's history on the 3DS, you probably know this most recent sequel isn't the only one to try and shake things up—even if it did try the hardest. Both 2012's A New Beginning and 2011's a Tale of Two Towns each had their unique gimmicks, but failed to address the pacing problems that can often kill interest in Harvest Moon before the first season comes to a close. It's unclear if Marvelous knew this Harvest Moon game wouldn't be released under its standard name outside of Japan, but regardless, it feels like a fresh start. This time around, there's no real twist: if you've ever played a Harvest Moon game, Story of Seasons should feel pretty straightforward. Unfortunately, this means we get the good along with the bad, meaning Seasons' first shaky steps don't do the greatest job of selling you on the experience. Thankfully, it's not quite as painful as A New Beginning's... beginning, which basically makes you wait through a whole month of tedium before things really take off. With this latest sequel, only an in-game week of your time is wasted on tutorials, but still, Marvelous is a little gun-shy about setting you free through those remaining days of Spring. It should be noted that I typically use the first season of any Harvest Moon game as a litmus test—if I can get through the typically poor pacing of that first pseudo-month, I know I've seen the worst it can offer, and things can only get better from there. 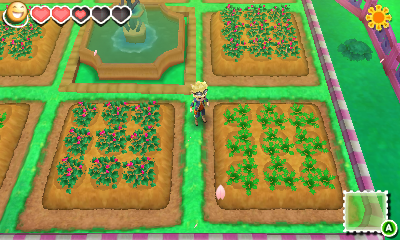 That's the extent I've played so far, so I can say Seasons definitely outdoes the past few Harvest Moons in this respect; after seven days of minutes-long instruction, you can set off on your adventures in agriculture. Still, Story of Seasons blocks off a great deal of content in its first season: outdoor pathways are blocked off, certain businesses are "still setting up," and the sleepy town your character moves to doesn't offer much in the way of hustle and bustle—it's your job to give this locale life, after all. Since Seasons gave me not much to do and way too much time to do it in, I'd typically take care of my livestock, tend to my crops, and try to find the few odd pieces of lumber and stone scattered around the overworld. Most days, I'd end up hitting the hay at 3:00pm because nothing else existed to occupy my time—taking that "early to bed, early to rise" adage to new extremes. Even with the extremely slow pace of its first few weeks, I'd be lying if I said Story of Seasons didn't work that old Harvest Moon magic on me. The slow-but-steady payoffs of honest, everyday work still exist, but this time, commerce has a more realistic component. Instead of sending your produce and various goods to market via the means of a seemingly bottomless box, your farmer is now tasked with selling without the involvement of a middleman. Every handful of days, a merchant from another land will appear in the marketplace, placing a priority on certain items; meaning that you can no longer rely on daily income to get by. This new method of profit also adds a nice risk/reward component: Sure, you can sell the 50 turnips you've been hanging onto, but would you rather wait until they're in demand and going for a much higher price? Whatever the case, even with only a season of the game under my belt, I found myself strapped for cash and counting down the days until the next merchant appeared. 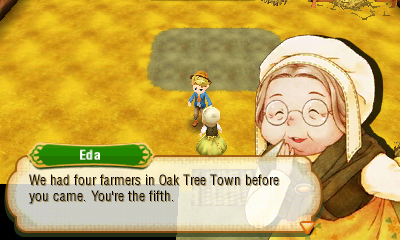 Story of Seasons might not have the most engaging intro, but it at least does what it can to make the typical Harvest Moon tasks much less tedious. You now work solely in terms of three-by-three plots, for instance, so there's no need to make sure you've watered, tilled, and planted seeds in each individual tile. Menus also require way less navigation than in past games, which has been a longstanding issue for Harvest Moon; now, you can assign any item to a quick slot that can instantly be accessed with a quick press of the R button. Interface issues have often been a roadblock in past Harvest Moon games, but Story of Seasons does what it can to make managing your inventory relatively painless. Even so, 2013's Rune Factory IV—an unexpectedly great spin-off—still has the best interface design for this sort of "slow life" game; it's a real shame some of the ideas from this series haven't found their way into Harvest Moon itself. This may not be the most convincing recommendation for Story of Seasons, but the truth is, you'll have to suffer through more than a few hours of tedium before the game really opens up. True, it's been a Harvest Moon tradition since the series left the 32-bit era, but it's one I'd like to see the series cast off; it's not a very complicated game to begin with, and I assume most people who pick it up have at least some idea what they're in for. Even though these first hours of Story of Seasons haven't been all that stimulating, I see the promise of a great game hiding underneath all of those artificial barriers. If the experience improves—and I'm thinking it will—I'll be sure to check in with another update. Tagged with harvest moon,	Marvelous,	Previews,	Story of Seasons,	USgamer.